The Alvirne High School Color Guard is an extra-curricular group that is open to everyone, regardless of gender, that works closely with the Marching Band. Together we perform in parades across the state and during the half-time shows at the varsity home and away football games. In the past we have also performed at Gillette Stadium and every four years we march “Main St. USA” at Disney World in Florida. The Color Guard gives a visualization of the music through movement. In our performances the flag is the main piece of equipment. The other pieces of equipment that are common to Color Guard is the rifle and the saber. If you love music and dance, but don’t play an instrument, the Color Guard is a great group to be in. If you like performing, but are more comfortable with being in a group, this will work well for you. The Color Guard takes place mainly during the Marching Season. 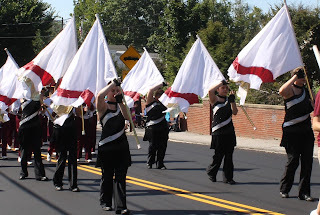 We may have a practice or two after the close of Marching Season to make sure we are ready for the holiday parades and the Memorial Day parade. Held each August. All color guard members attend. More information and dates to come in May. The guard also has their own camp called Guard Camp, which is the week before Band Camp. This is where everyone will learn the routines for the show as well as where those knew to the guard will learn how to use the equipment (mainly the flag for those new to the program). There is also a Freshmen mini-band camp that incoming Freshmen will attend. The guard attends Band Camp and both mini camps.